Monday, 22 July 2013 By Marchetto Pellami S.p.A.
De Marchi brothers create worldwide famous leather masks, also appreciated by Federico Fellini. The fashion lab is located in Toara di Villaga, within Vicenza area, in the north-east of Italy. 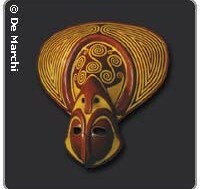 The fate and the personality of men are imprinted on their faces and the masks highlight the human archetypes. Every mask is a whole real life narration.